The Triple Creek Ranch is an award-winning luxury Montana ranch resort hidden deep in the Bitterroot Valley. A member of the prestigious Relais & Chateaux, Triple Creek Ranch offers a unique epicurean, all inclusive, vacation experience centered in the heart of the Montana Rockies. Triple Creek Ranch features a selection of private luxury log cabins and ranch homes for their guests to choose from that come fully equipped with the five-star amenities expected in such a luxurious setting. All rentals also have access to the spacious, luxury lodge that offers guests a Western environment with luxury amenities. With this picturesque mountain setting, guests have the opportunity to enjoy the nature and beauty the great outdoors have to offer. Triple Creek Ranch features a wide selection of cabins, suites, and ranch home for guests to choose from. Each of these accommodations features its own unique view of the surrounding mountains and exclusive extras that make them unique. Triple Creek Ranch features six, one-bedroom cabins perfect for a romantic retreat. These cabins come equipped with all the amenities needed for a guest’s stay while each features specific extras unique to that cabin. The luxury cabins boast private outdoor hot tubs, and massive log post king sized beds. The Cedar offers its guests an open floor plan and a wood burning fireplace perfect for couples. The Cottage is secluded retreat hidden in the forest that has a writer’s loft and hand-crafted spiral staircase. Castle Rock offers guests an oversized clover leaf hot tub and spacious sunroom. The Sugar, renovated in 2016 now provides a tiled shower and bathtub and private hot tub. The Suites are a quick walk from the main Lodge and all the relaxing activities it has to offer. The two-bedroom luxury cabins offered by Triple Creek Ranch provide guest with a spacious living area, two matching king bedrooms, sprawling outdoor decks, and private hot tubs. Each bedroom features an in-room master bath that features a palatial steam shower. The cabins are considered perfect for two couple, or families with children. Ponderosa is Triple Creek Ranch’s three-bedroom luxury suite. This spacious cabin offers 3600 feet of space with vaulted ceilings and a floor to ceiling rock fireplace. The open living and kitchen space offers guests a spacious area to mingle and spend time with one another. This three-bedroom, three-bathroom, the cabin is great for accommodating large numbers of guest or being used as a meeting space. Triple Creek Ranch’s luxurious ranch homes are ideal for guests who need to accommodate guests but require their privacy. These homes receive all guest services, and guests are required to have a vehicle to get back and forth to the Lodge and other attractions. The Riverside is a two-bedroom home that features a gorgeous river view, two-bedrooms, cozy reading loft, and a spacious deck that hosts a private hot tub and fireplace. The Osprey boasts a large wood-burning fireplace made of river rock and a private hot tub overlooking the creek below. Stage Shop offers a panoramic view of the mountains while featuring a separate, loft-style bedroom with a king bed, bathroom and private access. The cabins and homes at Triple Creek Ranch come with the amenities a guest both wants and expects. They also go above and beyond to offer all the extras that make visiting this unique resort worthwhile. While in-house, guests receive clean accommodations with air conditioning, satellite television, wireless internet, refrigerator, in-room safe, Keurig, direct dial telephones with free long distance, oil diffuser, bathrobe and slippers, and complimentary trail mix and fresh fruit. They also offer in-room dining options, daily housekeeping services, nightly turndown service, and luggage wranglers. For more than ten years, Chef Jacob Leatherman has been crafting the menu for guests at the Triple Creek Ranch. Chef Leatherman and his team have worked tirelessly to ensure each meal crafted at Triple Creek is something guests will remember when looking back on their experience. All meals, including packed lunches and snack, are included in the cost guests pay for their stay at the Ranch. Meals are served in the vaulted-ceiling dining room or can be delivered to cabins at no additional cost. Triple Creek Ranch’s own orchards and gardens make many of the meals served possible by providing fresh fruits and vegetables that have been homegrown on site. Dress code is considered ranch casual. Whether it be jeans and boots to shorts and flip flops whatever makes guests most comfortable is accepted. Throughout the year Chef, Jake and his team offer guests the chance to learn the trick of their trade by providing their own cooking school. To learn dates and times, visit Triple Creek Ranch’s website for more information. Triple Creek Ranch also features their award-winning wine cellar. This glass surrounded room greets guests as they visit the rooftop lounge. With an extensive wine list of 700 choices, the wine cellar offers guests something for any taste palette. During the year, events are hosted to allow enthusiasts the chance to indulge in the offerings of the wine cellar. Each evening before dinner guests have the option to make their way to the rooftop lounge. Here guests have the privilege of enjoying beautiful views while enjoying cocktail hour and relaxing from the day’s events. In the winter, guests enjoy the opportunity to relax and unwind by the beautiful fireplace while enjoying a drink. Triple Creek Ranch offers more than a romantic getaway. As an all-inclusive resort, there are a host of activities to make any visit more enjoyable. With events such as horseback riding, hiking, snowshoeing, fly casting clinics, archery, sapphire panning, lawn games, taking a nature safari, or tennis guests can find something to keep themselves active and adventurous. For those who prefer to relax a bit, the comfort of the pool is waiting, while many cabins and homes offer private hot tubs and reading nooks for just this purpose. 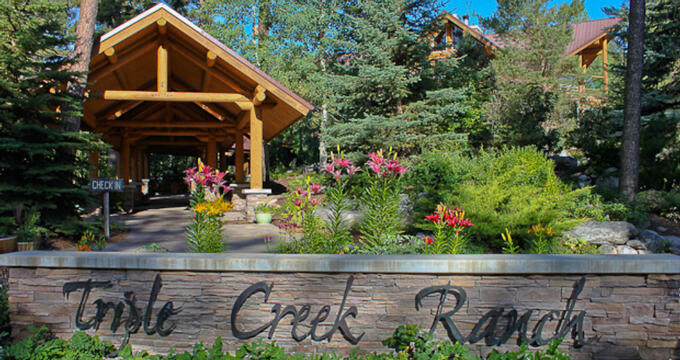 While Triple Creek Ranch boasts privacy and an intimate setting, it is still possible to mingle with others and enjoy the beauty of the ranch at the same time. The Lodge is a western decorated main area where guests can get to know one another and enjoy the extras the ranch has to offer. Dining and other events take place in this central location that is accessible from many of the cabins. Additional guests may find themselves needing to drive or request a shuttle to reach the main lodge. Triple Creek Ranch provides the opportunity to relax in the comfort of their own, private, cabin or home. By providing in-room massages, guests can experience one-of-a-kind treatments while unwinding from their exciting day. Their massage therapists offer a wide range of treatments that are tailored to help guests reach the level of relaxation they’ve been hoping for. For guests, convenience fees can be added to their bill. Triple Creek Ranch ensures their guests have a unique setting for their weddings or other special events they find themselves dreaming of having in this beautiful location. These events can take place throughout the year while other guests are in-house. Throughout the season, however, there are times when the entire ranch can be booked for these purposes. To learn more about these types of dates and about scheduling special events or meetings, visit Triple Creek Ranch’s website for more information.